By the end of this week, over half of the S&P 500 will have reported earnings. But, investors still seem uncertain and unwilling to commit to a new direction. This quarter’s earnings reports were supposed to provide some clarity as to whether the economy was heading into a recession, or even slowing enough, to cause a decline in corporate profits. That, in turn, would lead to a resumption of the bear market. Or the results would remain positive enough for the bull to reassert itself. Well, it’s halfway through the reporting season and investors seem more uncertain than ever. Thus far, with nearly half the S&P 500 companies reporting results, or bear estimates, revenues have grown by an average of 6% and EPS by 12%. This is fairly impressive, given that the comparisons are to last year’s 20% surge in earnings. And it should be enough to have stocks going broadly higher. But, the problem is that guidance has generally been negative with companies across many sectors from semiconductors to financials to industrials all lowering yearly forecasts — as CEO’s are reluctant to increase cap-ex or investment spending in the face of uncertainty surrounding the trade deal with China. Of course. we need to recognize that the stock market ripped higher during the first three weeks of January so many stocks were already well off, some by 20%-25%, from the December lows heading into their reports. That’s left the indices oscillating between the midpoint summer highs and December lows as well as investors totally uncertain as to which way it will go. Well, maybe they have decided; it seems many have headed to the sidelines. According to fund data, every price gain seems matched by an outflow, every inflow matched by a hedge. Despite the S&P 500 posting four consecutive weeks of gains and enjoying the best first two weeks of January in over a decade, U.S. equity funds saw outflows of $7.7 billion for a five day period in the five trading days thru last Wednesday, according to a BAML. The uncertainty was evident this week, even as most risk assets extended their impressive run. 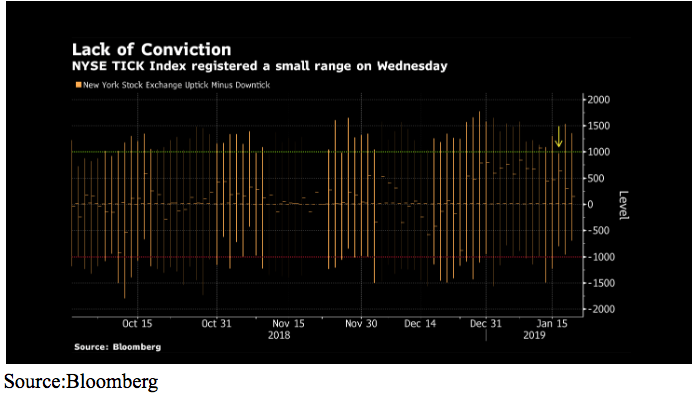 The NYSE TICK Index, which measures the number of U.S. stocks going up, trade-by-trade, versus those going down, failed to register a reading of 1,000, in either direction Wednesday for the first time since early November. The Fed, which meets this week, has also shown its uncertainty and indicated it too will move to the sidelines in terms of both raising rates and shrinking the balance sheet. While the market at first cheered the Fed’s more dovish stance, investors seem to recognize that the pause is the result of concerns about a slowing economy and won’t have a lasting, positive impact. While there are still some bellwether names such as Apple, Microsoft, and Amazon due to report this week, I think it will take a trade deal for, or an escalation of tariffs, to set the market in a clear direction. Until then, it looks like both bulls and bears will remain in hibernation.